The following is a description of the 2018 Graduate Student Research Institute, sponsored by UW Libraries and UW Graduate School Core Programs. Please note registration for the 2018 GSRI is now closed. an incoming graduate student looking for tips and advice? a continuing graduate student hoping to boost your research skills? a UW student set to start an intensive research project or research assistantship? 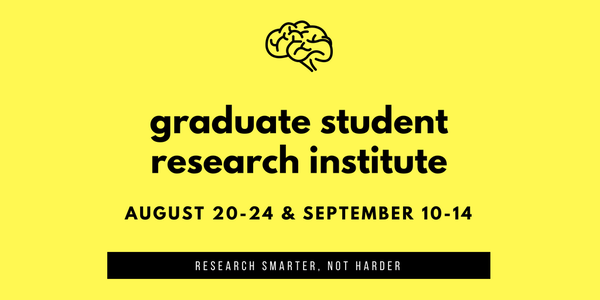 The Graduate Student Research Institute (GSRI) is a free and online pre-fall program (non-credited) offered by the UW Libraries and Graduate School Core Programs, aimed at giving new and continuing UW graduate students the tools and strategies they need to research smarter, not harder. Participants with common interests will meet together in small online cohorts, with personalized support from UW librarians and other qualified mentors in their subject areas. Topics include effective academic research, productivity tools & skills, academic support resources, and tips for taking your research to the next level. There are two sessions of GSRI being offered in Summer 2018. Space in a particular session may be requested, but is not guaranteed. This workshop is offered in Canvas (UW’s learning management system) over 5 days with no fixed participation times (asynchronous). Each day corresponds with one online module and activity, which will take approximately 1 hour a day or less. Registration for GSRI 2018 is now closed. For questions about future GSRI sessions and other online workshops, contact uwlibidteam@uw.edu.